So I got called for jury duty this week. Overall, it was pretty uneventful. I reported to the courthouse, checked in, sat in a room and read the paper. Every few minutes I blew my still-running nose on a tissue. When I ran out of tissues, I went to the drugstore during the lunchbreak and bought another pack. I did some work and checked my voicemail. I wrote an entry in my diary. I stared at the ceiling. I watched the clock. I sat next to a woman who took her shoes off, and had extremely smelly feet. So I moved to another chair. I ran into two people I know in the room. We said hi, and things like, "Wow, what a small world! Random that we got called for jury duty together!" I never got called to go into a courtroom. And when we were dismissed for good today, I gathered up my stuff and got on the elevator to exit the courthouse. On the way down, the elevator stopped at another floor, and a tough looking young man with gold teeth, large biceps and a ponytail got on. I took a step back so he could stand in front of me. From where I stood, just behind him, I could see, under his ponytail, that he had, in beautiful and elegant calligraphy, my first name tattooed across the back of his neck. I found myself staring in fascination at it, and wondering whether it was his girlfriend (or mother?) with the same name as mine. And why would anyone tattoo a woman's name across the back of their neck in large letters like that? And does he usually wear his hair down to cover it when he's at work, and today was a casual day so he felt ok tying his hair up and showing everyone? And was it fate that I was on that elevator and saw that tattoo? I exited the courthouse pondering this, and other weighty matters of great importance. So I've been feeling under the weather for the past 2 weeks. I have a cough, sore throat and incredibly bad runny nose. I mean it, it's really bad. I haven't had a nose this runny since I was about 4 years old. And it's starting to freak me out. Last week, I had to run out of a meeting at work because my nose was running uncontrollably. And everytime I blow my nose, I have to use about 20 tissues..and yet, there's still more and more. It's really disgusting. And it's really making me worried. By this point, I figure my brains have all leaked out. How can there be anything left in there? I went to the drugstore yesterday and asked the pharmacist if they had anything for runny noses. Not "stuffy" noses like the labels on all of the meds. He gave me a strange look and said to try the children's cold medicine. And even though I'm using the good expensive tissues (the ones with the lotion in them that supposedly soothe your nose), my nose feels like it's on fire. Yesterday I met a friend for lunch. I arrived at the restaurant prepared, having stuffed my pants pockets with tissues. But halfway through lunch, I ran out of tissues and had to run to the ladies' room. Of course, it was down a long, dark flight of stairs. And of course, there was a line. By the time I got in there, my nose was hemorrhaging phlegm. There were no tissues, so I grabbed a wad of toilet paper and blew violently. It kept going and going and going. Finally, I pulled the wad of toilet paper away from my face. I yanked, and a long ROPE of snot pulled outward from my poor nose. I pulled and pulled, and finally I managed to separate the wad of toilet paper from myself and toss it into the waste basket. But oh no, my nose wasn't done. It kept erupting, like a volcano. When it was over, I looked down at my cupped hand, and there it was - a large mass, a quivering gelatinous, colloidal, dumpling size ball of snot that I was holding. It was like a scene out of a horror movie, when the Glob rises up out of the slimy swamp and eats the girl. It was like a scene out of a war movie, when the injured soldier reaches down and realizes that he's holding his own liver in this hand. I'm sure the people outside the bathroom door could hear me screaming as I looked in horror upon what had just come out of my own body. Especially at 3:30 a.m., when I know I have to get up and commute to work in 3 hours, and all I can think about are the thoughts that are jumbled in my head, flashing by so fast that they're in run-on sentences. Like how we have to figure out a wedding budget and my apartment is so messy and I need to do dishes and when are we going to schedule those tastings at the potential reception sites and did the Boy find takers for his extra two Mets tickets and did I write back to the law student who emailed asking me for career advice and where is my flute and did I send that letter to the condo board with proof of homeowner's insurance and did I mail out my student loan payment this month and what date was my jury summons for and when is my next oil change due on my car and do I have enough clean tae kwon do uniforms to get me through this week without doing laundry and is the milk in my refrigerator expired yet and did I call back the guy from Marketing who asked me that legal question last week and where did I put that reimbursement check from the insurance company and it's time to buy new trash bags and how long has it been since I had the air conditioner filters replaced and have I called the priest to talk about premarital counseling and do I need to replace 4 incandescent light bulbs with compact fluorescents like the environmentalists said and have I dry cleaned the dress I need to wear to that law event this weekend and which level of the parking garage did I park my car on yesterday? Yesterday the Boy and I drove across the George Washington Bridge into lovely northern New Jersey. We went to this super-huge Asian mega-grocery store/food court/department store all rolled into one. It was unlike anything I'd ever seen. 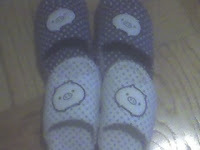 We bought matching his-and-her piggy slippers. 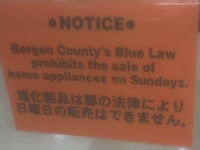 When I was growing up in the Deep South, we had blue laws, but they were mostly concerned with not selling alcohol on Sundays. Who knew that home appliances were in their own category of vices? I've been doing everything possible to avoid getting stressed about the details of planning this wedding. Well, that's not entirely true. I've been making a list of big plans to hit (reception, ceremony, date), getting stuck at work late a lot (well, that part is not by choice), and overall trying to relax and figure out basic stuff without getting hung up on details. A high maintenance princessy coworker (who got married last year in an over-the-top ceremony that was reminiscent of Princess Di's) asked me the other day, "So..have you thought about who you're going to use as your lighting designer?" My best friend has invited me to a barbecue at her brother and sister in law's house for July 4. It's still 3 weeks away, and I know I don't have any other plans that day. Plus, I love barbecues. And yet, I've politely declined the invitation. The reason is simple. My friend's sister in law is really stingy with food. The last time I went to their place, it was for a Super Bowl party 2 years ago. First, there were only four of us at the party: the brother, the sister in law, my friend and me. So it wasn't a big party. Even then, she made my friend and me bring lots of food - chips and dips, cookies, sodas, beers. Second, she cooked a pot of chili, and gave us each a scoop of it in a little bowl. Then she quickly packed up the pot and put it in the refrigerator, and didn't offer us any more chili for the remainder of the 3 hours we were there, watching the football game. Then, she kept all of the chips and dip, beers and other stuff we'd brought, as leftovers. The time before that, we dropped by in the morning (at their invitation, and to do them a favor by bringing them something). They were eating breakfast. She made us stand around and wait while they packed up some other stuff for us to take to someone else (again, as a favor to them). At no point did she offer us anything - not even a glass of orange juice. It got kind of awkward standing there for half an hour, watching them eat. The brother looked like he wanted to offer, but he was too scared of his wife. None of this seems to bother my friend. And I don't say anything, since it's awkward to tell your best friend that you hate her sister in law, and that's why you turn down all of her invitations to hang out with her extended family. So yeah, there's no way in hell I'm going to their house for a party. I know if I do, it's a guarantee that I'll have to stop at McDonald's on the way home. I've been out of commission for a few days. I spent them in a legal seminar. It was one of those events where you're locked up in a hotel conference room in a strange place for many hours straight, and you emerge to find out that the world has gone on without you and you have no idea where you've been or how much time has passed. Apparently, Paris Hilton went to jail while I was in SeminarLand. When was somebody going to tell me? On top of that, when we left the seminar last night, there was a 2-hour delay for several people who had parked their cars in the lot next to the hotel. Someone got shot in that parking lot, so there was police tape everywhere, and no access to the cars. Everyone had to stand around and watch while they evaluated the crime scene and hauled off the bodies. Pretty gruesome. I think that would turn me off to legal seminars for life. Not that I need any additional reasons. I'm back in town. I spent the whole weekend at my college reunion! It was fun. I was also on the planning committee, so it was a pretty crazy weekend for me. But I did have time to kick back and enjoy myself. And I introduced the Boy to so many people, I think I said the word "fiance" about 100,000 times over the course of the weekend. By the end, I was changing it up. I was saying, "intented," "betrothed," "affianced" and things like, "This is my dude" and "This guy and me, we be throwing us a big party next year." I even started saying "FIANCE" with an obnoxious French accent. I now think that's the only way to say it. "Oui oui, thees ees my FIANCE!"